Creedite: Tonopah, Nye Co., Nevada. 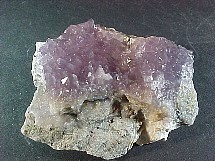 Lustrous, almost druzy-like purple creedite crystals on matrix. 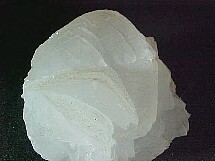 This is a pretty little miniature from the Aquatorial Mine. 1-1/2" across. 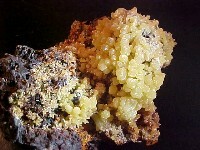 Glistening spheres of lovely greenish/yellow mimetite crystals on limonite-like matrix. A small cabinet piece from the Mina El Potosi, Santa Eulalia. 2" (5cm) across x 2-1/2" (6-1/4cm) tall. A nice, pretty cluster of white crystals. 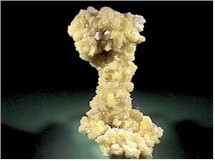 There is very minor matrix on the bottom of this miniature from the Herja Mine. 1-1/2" across x about 1" tall. 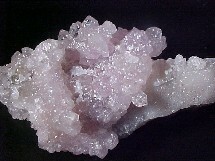 Light pink rose quartz crystals. 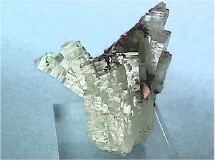 This lovely miniature from Coronel Murta, is a pseudomorph after spodumene, and can be displayed several differnt ways. 1-1/2" across.